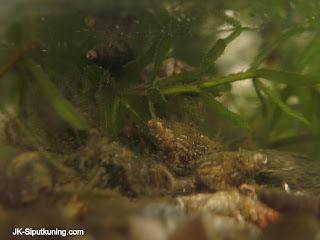 SiputKuning Journal: Freshwater whelks, anyone? Sea whelks from the family Buccinidae has been a common food for many cultures especially those from polar and temperate regions. But have you ever heard of whelks from rivers and lakes? For the aquarium enthusiasts, this may have struck a chord in them. 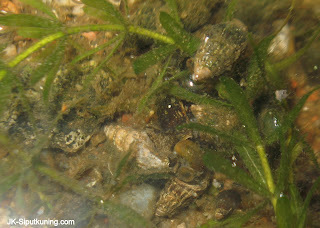 Freshwater whelks (a.k.a. assassin snails) are well-known for their ability to "massacre" almost the entire population of aquarium snails in just a matter of hours! Yes, they are carnivorous and vicarious snail-eaters - the ultimate weapon-of mass-destruction for those who wanted to make their snail-infested aquariums a thing of the past. Clea helena (Meder in Philippi 1847) from Sungai Jernih, Perlis, northern Peninsula Malaysia. 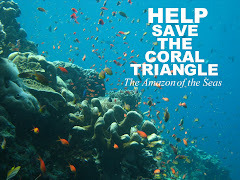 Note its difference from Thai varieties offered in the aquarium trade. On the scientific front though, little is known about this enigmatic group of snails. However, it is generally accepted that there are two genus of this family that somehow abandoned the sea in favour of creeks and ponds. The African species is categorised into the (sub)genus Afrocanidia while Asia's is grouped into the Clea genus. Now, this may shed some light to its origins. Perhaps, they first appeared from a common ancestor when Africa and South Asia was in one piece (called Pangea) 225 million years ago? or did they adapted to freshwater separately (convergent evolution) since it is more likely to be a recent adaptation? Steung Saen, Kampong Thom, Cambodia. This is the preferred habitat for Clea species as it has a wide, muddy river bottom. 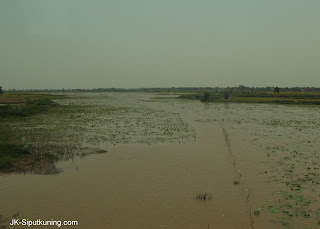 Such habitats are widespread across delta plains of Southeast Asian countries. Information on the African species is particularly void while Asia's ones received more attention (from the aquarium trade, not researchers!). Clea genus is widespread across Southeast Asia and have not been recorded elsewhere. 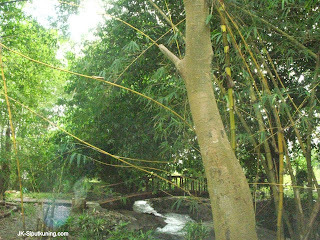 It's abundance is notable especially in alluvial plains and around large water bodies like the Irrawaddy delta (Myanmar), Mekong River (Indochina countries) , Chao Phraya River (Thailand) and other major waterways and lakes of Malaysia, Brunei and Indonesia (Sumatra, Java, Kalimantan). The question is - how did they managed to reach other rivers and lakes divided by tall mountain ranges and vast seas? Sungai Jernih, Perlis, northern Peninsular Malaysia. Another typical habitat for many Clea species as they have abundant prey to feed on and nutrient-rich waters flowing from nearby caves. The possible answer can be found when we turn the clock back to around 20 000 years ago. The waters of South China Sea, Gulf of Siam, Straits of Malacca and Java Sea recede and is replaced by alternating grasslands and swamps. Now, one would notice that major rivers were being drained out of this large peninsula, dubbed Sundaland, by "mega rivers" (much like the present day Amazonian Basin). So, it's possible that the Clea genus or its ancestor have had its early millenias conquering much of Sundaland's freshwater systems before rising sea levels cut off many populations and from there each evolved into seperate species or subspecies. Clea helena is a very resilient snail. 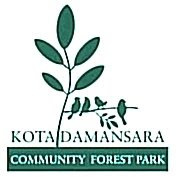 It can lay dormant for more than a month without food. In this stage, it usually buries or half-buries itself in the loose, sandy or muddy substrate. It will then wander around to locate the prey. However, it takes a straight path towards the prey if there are no others in the vicinity. 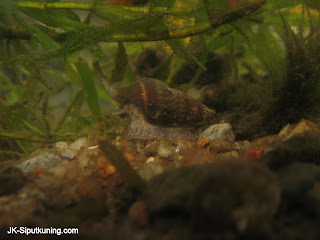 Usually, Clea snails can be found in abundance when present in a water body. 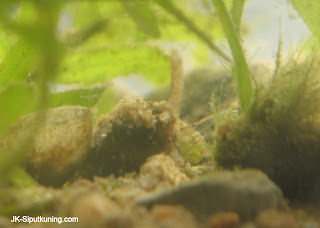 Thus, when a prey is detected, a large number of snails will search and assemble around it. 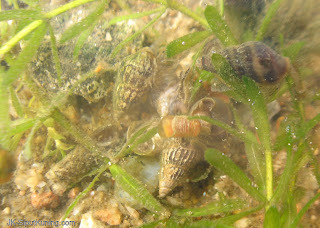 Meanwhile, other Clea snails will try to loosen the grip of the feeding predator on its prey by using their foot to "pull" the prey out, much like a tug-of-war game. It takes about half an hour for Clea helena to finish its meal but that may be because of the miniature size of the prey. For larger size meals like frog carcasses, it might take a day or more to finish the entire body. Most of the time, they will abandon their meal when they are full and return back when they're ready for the next meal. 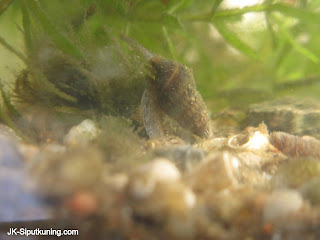 After some time devouring its prey, other snails will lose interest and gradually retreats back to their hideouts, leaving the lucky snail and its meal alone. At last, when the meal is finished, the predator will crawl back to its own resting spot, leaving empty shells of the prey behind. while Clea gemma (Conolly 1929) is the type for the Afrocanidia (sub)genus from Africa. Not surprisingly, Buccinids aren't the only one which has migrated to freshwater environments in Southeast Asia. There are also genus Nassodonta (East Asia), Pygmaenassa (India) and Arcularia (Lake Chilka, Burma) from Nassariidae, Rivomarginella (Southeast Asia) of Marginellidae, various genus from Neritidae and Morrisoneitta (Thailand) of Pyramidellidae. 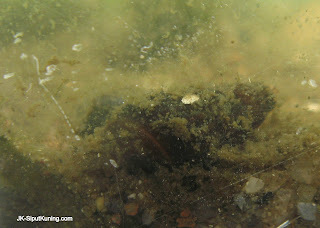 So, who knows what more lurks in the muddy depths of these tropical rivers and lakes? 1. Trew, A., 1987. The Melvill-Tomlin Collection. Parts.50,51,52,53,54. Buccinacea (Pyrenidae, Buccinidae, Galeodidae, Nassariidae and Fasciolariidae). 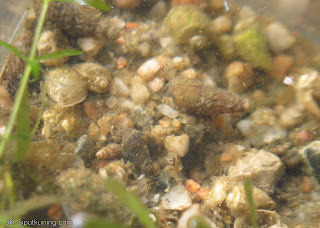 Ellen E. Strong, Oliver Gargominy, Winston F. Ponde, Phillippe Bouchet,2008 Global diversity of gastropods (Gastropoda;Mollusca) in freshwater. Hydrobiologia (2008) 595: 149–166. Freshwater Buccinids are first recorded in the fossil assemblages of the Miocene period (approximately 23-5 million years ago). Hi! Nice work you've done here! I'm Portuguese malacologist currently finishing my PhD thesis on gastropods in the aquarium trade. Clea helena was one of my studied species! I wonder if you could contact me by email so we could exchange some thoughts? No problems with that and thank you for your keen interest and kind words! 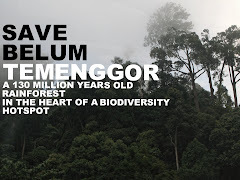 I am trying to ID a species of Clea I collected in a hill-forest torrent in Brunei. I think it might be C. nigricans. 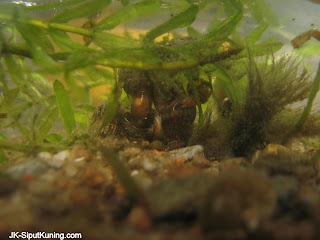 However, I found descriptions of other species that are rather similar (C. funesta, C. bockii) and would like to share some thoughts. Could you pls send me a mail to gianluca.polgar@gmail.com? I am trying to ID a Clea that I think is C. nigricans, collected in a hill-forest torrent in Brunei. I just found that Canidia bocourti Brot was synonymised as Clea helena by Brandt (1974). Thank you for the very informative updates! The genus Clea is indeed very interesting!